Welcoming strangers into your home isn’t for everyone, I know I get it. Sometimes, you don’t even want to share your home with someone you love. But in today’s economy, you do what you have to do. 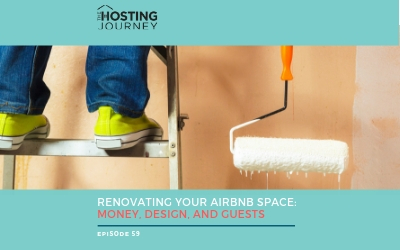 You can hear more about my own humble Airbnb beginnings, and also my many learning experiences (ok, mistakes, and there were many, in Episode 1: My Personal Hosting Journey. I started Airbnb back in 2010, when, as I like to say, the economy shifted. 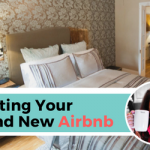 My career shifted with it, but I found Airbnb and never looked back. I gave up my bedroom, my very comfortable bed and moved over to what used to be my roommate’s room. I have been living with strangers ever since for over 8 years. Or like David, a fellow host likes to call them, friends I haven’t met yet. I don’t mind my guests (most of the time). I see them as temporary roommates who eventually leave. Some return every year; others I never see again. After 8 years of hosting, a lot of my old guests remember my home and recommend me to their friends. It’s a pretty good system. I take notes of all of the people who stay in my home, so when they want to return I have a record of the good, the bad, and the ugly. For return requests, I go back to my notes and then I decide…Oh right you were good guests, I don’t mind having you back in my home. Today, I’m going to be talking to you about a delicate subject. I hope that for the most part, we like our guests. Some I tolerate, some I actually love, and others I love to see go. Never to return. I had a streak of guests that I loved. I’m not saying that I don’t like my other guests. I just don’t always interact with them. Many come and many go. They’re either doing the touristy thing, visiting family or working. We don’t chat. They’re busy with their life. I’m busy with mine. The parents did the booking since they were college girls. Yes, third party booking, a big no, no. But I accepted the reservation. The oldest one was already going to college at Vassar, and the younger one was visiting colleges for graphic design. My home was their NY base. They were polite and friendly, and we even shared a meal together with a couple of my friends. Well, to be fair, the girls ate cookies and milk while my friends and I shared a real meal. We did offer, but they were into the dessert part. Right after they left came one of my favorite families in a long time. It was a Mom and her two teenage kids. We all liked each other from day one. Mom is a school teacher, and I love to read. 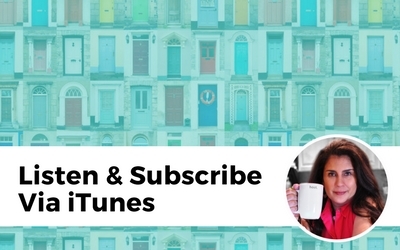 We chatted about books, her kids, and life. So many good stories! Her son felt comfortable and even offered to help with the house’s very stinky trash… I wanted to say yes, but I held back and dealt with it on my own. He was such a respectful, inquisitive, and energetic young man. Her daughter was quiet, a young person in her own world, about to off to college. But she was also present, ready to take on the world. On their last day, they all came into my bedroom. That’s my private space, my sanctuary, my “don’t you dare come on in.” But I have invited them in so they could share their previous night’s adventures…I had made reservations for them at my friend’s restaurant Negril Brooklyn, where they had great food and ambiance and really enjoyed themselves. The best way to end a vacation. They were telling me their stories all piled on my bed, sharing, talking, and creating memories. Mom and her two kids each have a piece of my heart. Then they were gone, and I had a night for myself. It was glorious! And then I got an instant booking from a young lady coming to New York for work. She was super happy to find my home at the last minute and overjoyed that I allowed her to check in early. She was even more excited about my food recommendations. I’m telling you my House Manual rocks their world… Every. Single. Time. 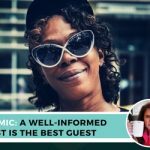 This guest was from the Caribbean, we chatted a few times about work, food, and life. I was all, “ohh you want Peruvian? This is the place, girl.” The best coffee? Here are two of my favorites, and it’s not Starbucks. But if that’s what you want, here it is. She had lunch at my favorite Puerto Rican spot, and she was a very happy woman, having some yummy food before going to her conference. I work from home, so if you’re around chances are we’re going to run into one another and talk. We might share a meal, and you might even meet my friends. My life doesn’t stop because you’re here. You might join in, but only if you want to… You don’t have to. This is how I home share. Yes, I’ll also give you privacy, and I also request privacy for myself. I know how to create healthy boundaries and put up my own privacy walls, even if they’re invisible walls. Wondering how I create those imaginary but very effective walls? Here’s how? I have my own living room, and that’s my private space. I put my headphones on. I record these podcasts. I might be on a call. I wear my, “I’m working face.” RBF for those in the know. Sometimes, I work from my bedroom and don’t socialize. It all depends. The guests I just told you about were pretty exceptional. And then, I had “the” guests. Oh yes, THOSE guests. They were the kind of guests that blew through my invisible walls like a hurricane, and I had to go to my backup plan. I left. That’s right. I left my home and stayed at a friend’s house until they were gone. Worth it? Definitely. My health and my sanity are priceless. Self-care comes first, my dear hosts. These were the guests…you love to see go! From the beginning, communication wasn’t great. She booked for 4 people and didn’t let me know that it was her family. Mom, dad, older brother, and herself. I assumed differently (you know what they say about that…). I thought it was her and friends.. Maybe some college girls. I like those.. Nothing wrong with a family. Clearly. Come on. I loved my previous family. I was glad I was home to welcome them, as sometimes I’m not and I let my guests self-check-in with the lockbox. Naturally, the brother and sister didn’t want to share a bed, but thankfully I have an air mattress as a backup. I dig it out and set it up, even though I had to leave to get my day started. 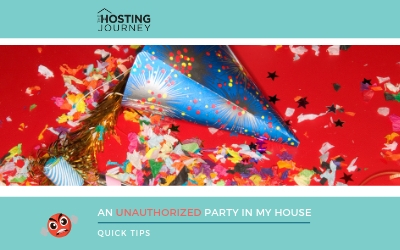 As soon as they walked in, the parents took off their shoes, (thankfully) and placed their feet on the sofa (not thankfully )Yes, we all do it…but, but. I was all, “You just got here. Can you wait until at least I’m gone?” I know, right? Or is it me? Not the best way to start. Or get off on the right foot. I left for the day and came home, hours later, to a blindingly bright house since they had left all the lights on. And my house just didn’t smell right. I don’t use scents, yes, I’m sensitive that way. There was this odor in my home… it just smelled…off. My place has two bathrooms, one per floor. My guest space and my bedrooms are on the same floor where we share the small bathroom. The next morning I heard them finishing in the bathroom. I left my room to take my turn, and there was the dad, peeing. The door… Wide open. Thankfully, it was number one and not number 2, so all I saw was his back…but I still had to contend with the images flashing through my head. I mean, seriously, how hard is it to close the door!? It was something I could not unsee. Yeah, I was fed up. Were they horrible? No.. Had they broken any house rules. Nope. I felt they were better off in a private apartment than in a shared home. Maybe it was just me. The smell, the peeing, bad chemistry. I dunno. 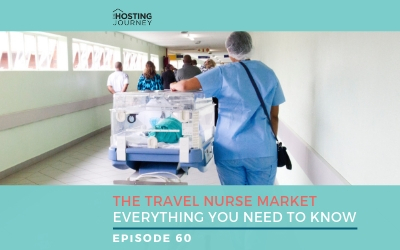 The reality is that guests are usually out and about during the day. Well, except that one guest who did not leave the house. which is why now I have in my description quote: “I mostly work from home, so my preference are guests who will be discovering NY.”I’m telling you, this guest loved my backyard so much she didn’t leave it for two straight… Yeah… two straight days. I want people to get out and explore. I mean, you are in New York City, for Pete’s sake! What are you doing running the air conditioner or sitting in my backyard for 48 hours? If I can I try to stay away, I do. This time I was able to stay at a friend’s home for a couple of days. I actually had my own bedroom and bathroom. Better than being at home. I wanted to stay. It was Luxurious. The family… welcoming. It’s always cool to be a part of someone’s life, even if for a short minute. I hope I was a good guest…but I think I might have put my feet up on the sofa when I was meditating. Ideal? Maybe not. And you might say, “Evelyn, I’m not leaving my own home.” But it was them or me, and I took self-care to another level. A mini vacation from laundry, construction, and guests. I also have very specific House Rules, which I speak about in Episode 4: He Ate My Avocado: Setting up House Rules and Boundaries. You need to have house rules that are clear, cohesive, and comprehensive. The three C’s. Go take a listen. Closing the door when using the bathroom? That’s just common courtesy, especially when you’re in someone’s home. But I guess I needed to let them know when giving them the tour of the house. It’s not so bad, I guess. I mean, in 8 years as a host this was the first time something like this happened. 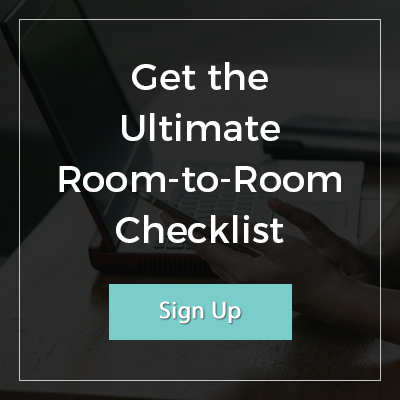 Plus, you don’t want huge a list of “don'ts in your house rules. House Rules! The guests I love to see go didn’t break any of my house rules…and didn’t eat my avocado…because then, then whoa. If they had, I would be taking an entirely different stance and position. Look out, world! 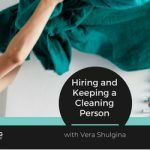 In reference to self-care, I also hired my cleaning lady because I just didn’t want to deal with their mess. Not that they left a bigger mess than usual, but I just didn’t want to deal. After all, the house didn’t smell right. Sometimes you have to give yourself a break. It might mean blocking a couple of days, staying at a friend’s home for a few nights, or hiring that cleaning person. 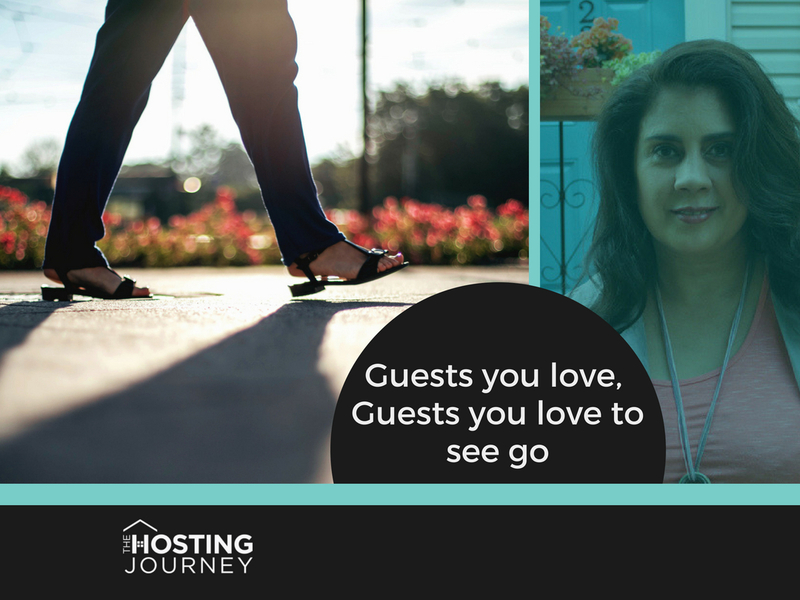 Do you actually tell your guest to leave? 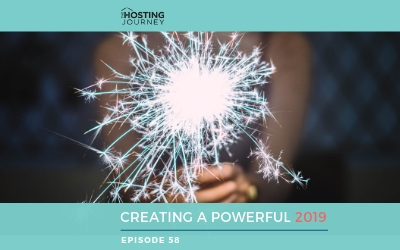 Let us know what do you do for own self-care about those guests you love see go…. Post it on the FB group. Don’t be shy. 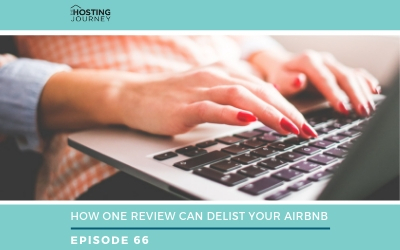 Remember, there is always a light at the end of the Airbnb and vacation rental tunnel because that guest will eventually leave. That’s the beauty of short-term rental. You get to say goodbye! For the guests you love, you get to say hello. Some of the links mentioned are affiliate links. if you choose to make a purchase, I may earn a commission. Commissions come at no additional cost to you. 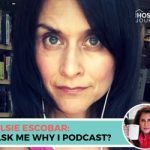 THJ 15: Elsie Escobar Ask Me Why I Podcast? 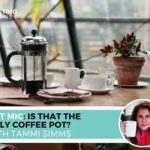 THJ 11: Hot Mic- Is that the Only Coffee Pot?